The promise of a simmering cup of Joe just got more fun with three alcohol-induced flavors produced by Illinois firefighters who formed the company Fire Dept. Coffee. The Bourbon Infused brew was simply delicious. Its smooth refined taste mirrors that of popularly consumed whiskeys such as Jack Daniels and Jim Beam, but unlike alcoholic beverages, Bourbon Infused elevates the connoisseur’s sense of awareness. Almost immediately upon consumption the connoisseur detects a hint of sweetness reminiscent of honey that is soon followed by a subtle sophisticated aftertaste commonly found in whiskey. Whether studying for a test, driving cross-country, or simply relaxing at home, Bourbon Infused is an excellent choice for the coffee connoisseur. But the Rum and Tequila brew are also outstanding choices for that Cup-of -Joe lover. Making a a Hot Toddy from a cold ingredient just became easier with Fire. Dept. Rum-laced coffee. The only downside is your refrigerator will have the iridescent scent of a teenager’s dorm room with a not-so-mild aroma of alcohol permeating the space. We actually had the tequila brew in our car for a few days – and it took a few days to air out the car. However, if you can tolerate that annoyance, this variety of coffee is as easy to brew as any other premium drip coffee. The scent is stronger than the taste, but the ease and novelty of use more than make up for having to check to find that your teenager has taken your favorite bottle of Rum or Tequila from the cabinet just as you decided to settle down with a nice liquor-laced coffee. Fire Dept. 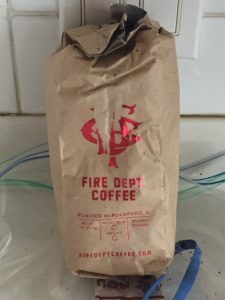 Coffee is owned and roasted by firefighters (Luke, Mark and Troy) in Rockford, Illinois. It is made to order from sociably and environmentally friendly farms and they donate portions their proceeds to Firefighter or Veteran Assistance Programs. Check the product out online and get your own 1 pound bag of Infused Coffee for just $19.99. Fire Dept. Coffee guarantees a full refund if the brew is not to your liking. Domestic shipping is free with any purchase exceeding $50.00.